The Rockford varsity softball team took a road trip to Caledonia, Wednesday, May 23 and came home with an 11-9 victory. The teams registered 19 hits on the night, sprinkling runs throughout the seven-inning game, with Caledonia owning a 3-0 lead after the first. The Rams battled their way back, and the score was knotted 4-4 at the top of the fourth before Caledonia plated four runs in the bottom of the inning to reclaim the lead. The Rams didn’t roll over, however, and plated two runs in the fifth, three in the sixth and two in the seventh, while holding Caledonia to a sole run in the seventh to claim the victory. The Rams tallied 10 hits on the night, with Kylie Winkels tallying three hits (two home runs) and four RBI. Jenna Davis also registered a home run for Rockford. 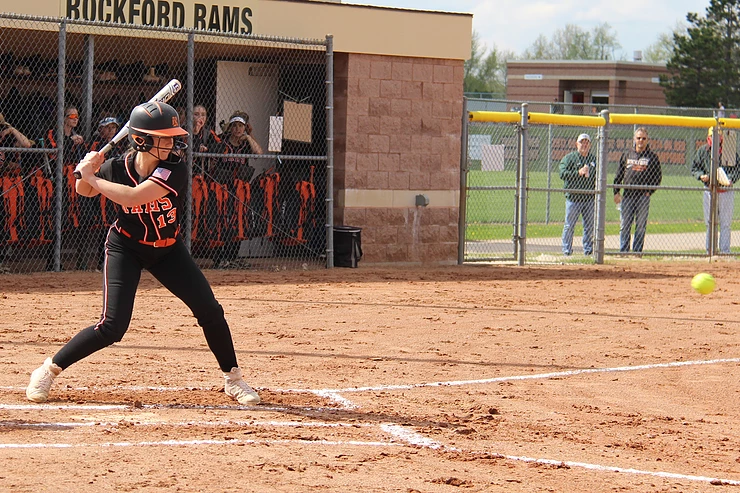 Chloe Bowen recorded two doubles and Mykayla Vallad, Addison Binney, and Katie Wendtland had a double apiece for Rockford. Davis earned the win, giving up nine runs on nine hits. The Rams will start post-season games after the Memorial weekend holiday. ©2019 ROAR Magazine - Rockford's Official Athletic Report / SportsEngine. All Rights Reserved.